This is a painting of a flower I fell for 'hook, line and sinker'. I think, by now, most people are aware of my love of all things Orchid, so it won't come as much of a surprise, but this is an orchid that I'll probably never own. It just grows too big! I ran out of space a long time ago and still the collection is growing. I've had to repot and split a few this week, so I've suddenly got two more plants I didn't anticipate, but I digress. My new love is an Orchid I met at the Orchid Festival of Wales, on the stand of The Orchid Society of Great Britain. 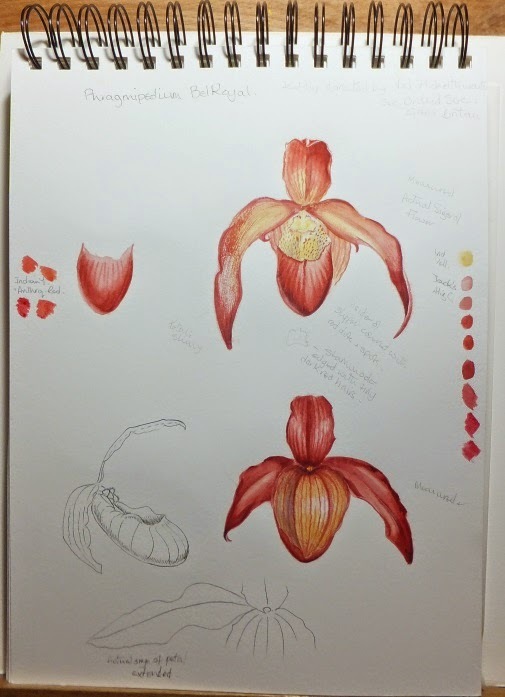 It's a Phragmipedium Bel Royal and is one of the most striking slipper orchids I've seen. The colours just glow! 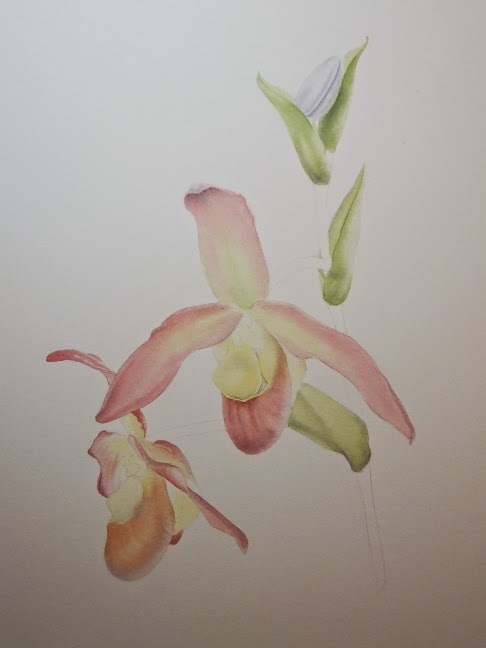 It was one of the flowers I was given to bring home with me to paint, and I've got plenty of drawings and sketches despite having to work so quickly to record it. The first picture shows the delicate first washes of colour laid down, reserving the white areas to keep the highlights. This is the stage where I often feel that it's going wrong and maybe I should start again. Nerves of steel are needed to continue. It also takes a lot of patience, waiting for the washes to dry. Painting on damp washes is one of the quickest ways to dull a painting. 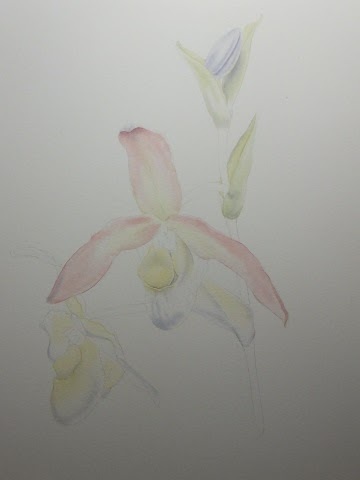 This second picture shows how the washes have developed and the shadows are beginning to give shape to the flowers. Edges need tidying up in places and I'm removing as much pencil as possible at this stage. The last picture shows how further washes have been added and the painting is now starting to look a little more like a pale version of what I have in mind. There's quite a bit more work to be done and many more washes to come, but not all over. Pale areas will stay very pale unless I need to adjust them. I hope you've enjoyed this work in progress, I'll update it in the next few days as it grows and develops. Your painting is shaping up beautifully! Thanks Janine, it's lovely to hear from you. This is going to be a really lovely painting Polly, I can just tell. Great colours - quite unusual and really flowing shapes. Lovely to see you still working away... Hope you are enjoying it too. Hi Jess, I'm glad you have faith in it, yesterday I almost started over - it was at 'that' stage LOL. I've stuck with it though. I love doing this, even when it's difficult, I can't imagine wanting to do anything else! It's great to see the continuation of the inspiration that is the Orchid Festival ! - I'm loving my purchase of your beautiful work. Hi Paul, I'm so glad you're enjoying your painting. I'm hoping to do a few more for next year. 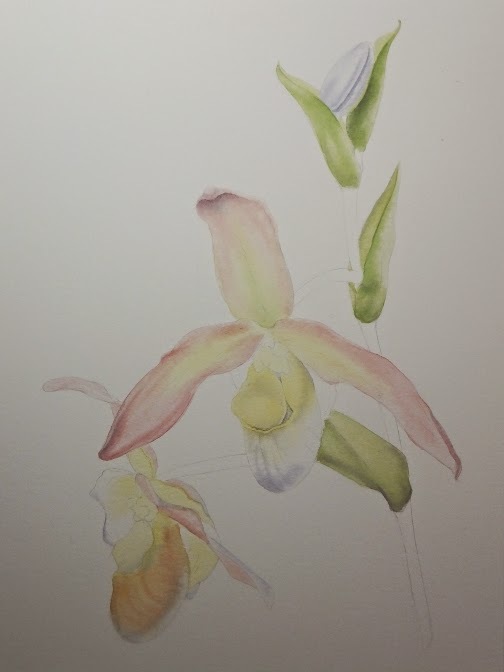 There were so many beautiful orchids, I wanted to paint them ALL!